On July 17, 2016, 15 men stormed two poultry farms located at Egan, Itoki area of Ikorodu, Lagos. They went with three AK47 and rifles, one pump-action rifle, nine magazines and 270 rounds of live ammunition. As soon as the men, who arrived the area in three boats got to the farms, they grabbed the owners, – Alhaji Oyebanji Wasiu and Alhaji Isiaka Owolabi along with the manager of the two farms, 43-year-old Abiodun Adeniyi. But this was no ordinary kidnap for ransom. When three suspects in the case, who are now in police custody, narrated the event that led to the kidnapping, it became clear that there was a deep-seated vengeance involved. The kidnappers’ inside man, 24-year-old Idowu Dauwujoh, who is also one of the suspects in custody, told our correspondent that when he got a job as a worker on the farms, he was employed along with three other friends, Kekeminiwei, Afro and Odesebra, all Ijaw young men. Dauwujoh, who is also an Ijaw man, said few months after they were employed, Kekeminiwei, Afro and Odesebra were sacked. He said, “The allegations were that they were stealing from the farms. Then, Afro was dating a lady who also worked on the farms. It became an issue between him and the manager of the farms (Adeniyi) and the man told him to leave. Few days before July 17, 2016, Dauwujoh, called his friends to inform them that his bosses would be around in a few days. As soon as the owners (Wasiu and Owolabi) arrived their farms on Wednesday, July 17, Dauwujoh gave his friends the signal and they moved in. Dauwujoh said when they kidnapped his bosses including the manager, he had no idea where they were taking them to. But he fled the farms to Delta State. One of the suspects in custody, 26-year-old Priye Idoro, said he took part in the kidnapping and was actually the cook in the camp where they kept their victims. Idoro said, “Before that day, I was not a kidnapper. All I was doing was bursting pipelines to steal crude oil at Igbo Olomu (a suburb of Ikorodu, Lagos, where militants sacked the entire community recently). “One day, one of my bosses, who employed me as a pipeline vandal, informed me of the kidnap plan and I willingly went along. Saturday PUNCH learnt that the victims were taken deep into the creek where they were instructed to contact their families. Their families later put together the sum of N22m as ransom which they dropped in a particular location as instructed by the kidnappers. Idoro said, “The first day we brought the men to the creek, I was told to go and buy foodstuff by nightfall. I bought fish, soup ingredients and garri. “I was feeding them eba most of the time. Cooking was all I was doing, my bosses were the ones doing the negotiation. When the ransom was paid, they told me it was N20m. They brought the money in a carton and two ‘Ghana-Must-Go’ bags. “They gave me N500,000. I treated the men well. Before they released them, they were even praying for me that I would do something great with the money I got. The group dispersed and Idoro travelled to Sapele, Delta State, where he bought a boat with his own share. He said he wanted to use the boat for water transport. He would later be arrested at Sapele. The police tracked down Idoro and the other two suspects, after the murdered manager’s phone was tracked by the police and located at Delta State. 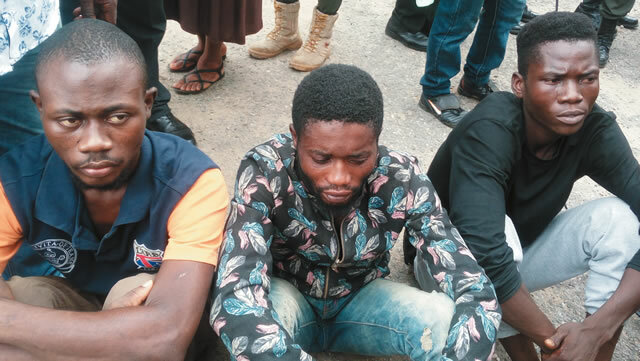 One of the kidnappers had given the phone as a gift to his brother, 27-year-old Daniel Jekene, who quickly helped in getting the other two arrested after the police nabbed him. When Dauwujoh was arrested, it was learnt that the gang had given his N2.5m share to his elder brother to give to him. But the elder brother absconded with the money. The Lagos State Commissioner of Police, Mr. Fatai Owoseni, said investigation was still ongoing to arrest other members of the gang. He said the suspects would be charged to court as soon as investigations were complete.